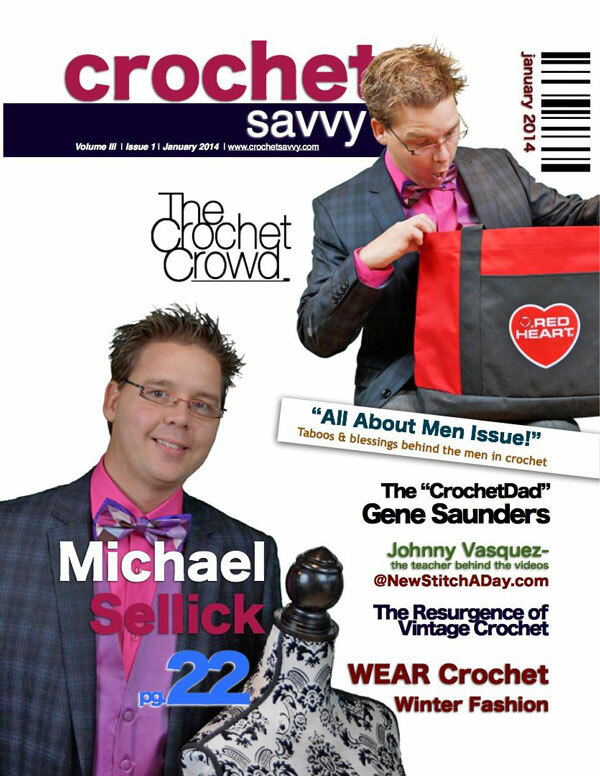 Launching January 30th, 2014 is the latest edition of Crochet Savvy Magazine. It’s a free ‘digital only’ magazine that you can access. It’s loaded with great stories and patterns that crocheters will love. The Editor-in-Chief, Keturah approached me in early December to see if I would be willing to do an interview. The magazine issue is dedicated to Men. I must admit, I did laugh a bit because me, being classfied as manly, is a bit of a joke… even to me. Keturah’s questions were food for thought and I will say that I took nearly 6 hours of writing down my answers for the interview. I will say to you though, I’m not sure what she has written, I just have answered the questions as openly as I could. Most of the questions were in relationship to men being in the crafting industry. What are some of the hurdles and restrictions men face when being in an area that is dominated by women. I used to think like that many years ago, today… I just function to the best of my ability. Not everyone will like me, nor appreciate what I have to offer. That is life… accept it and move on. The question of me being male in the yarn arts isn’t a question in my mind anymore. I’m here, I Hook and I’m proud of it! I am what I am and feel I am at the right moment in my life for everything that is upon me today. I will say though, I never expected to be working the insane hours I do each week. My passion trumps any tiredness and exhaustion I feel. In a regular job, I would be gunning out the door at the said time… Even tonight, 6:30 pm on a Sunday… I’ve been working since 8 am this morning. My passion makes my job exciting and fun. I was really open in my answers and is the first time to be featured on the front cover of a crochet magazine. Look for this coming up for launch on January 30th, 2014. This entry was posted in Announcements and tagged Cover, Crochet, Crochet Magazine, Crochet Savvy, Interview, Mikey. Bookmark the permalink. Love your tutorials. Love all the new patterns. You are a super teacher, I should know after 30 years as a teacher myself. You inspire so many and deserve to be noticed for your contributions to fiber crafts. After many years of making afghans for everyone in the family I now make hats and blankets for neonatal units in the Atlanta area. I always look for new patterns I can adjust to the smaller baby sizes. Thank You and Congratulations!! Too cool. Love your videos. Congrats! Congratulations Mikey. Don’t see where you sign up for magazine. hi Mikey, congratulations. well done. it is nice to get artistic and passionate information for the craft, for a change. I have never met you, but your exuberance comes out in every newsletter. So you are a man….so what, the fun and passion, is the best thing. being a man, is a bonus.!!!!! men used to knit, years ago, and i believe that men did a most of the blackwork embroidery, in the 14th/15th century, because it was thought women would not be able to work out the mathematics of it.!!! so…. more please, MIKEY, THE MAN!!!!! awsome Love that its your passion and rewarding us with your insightfulness. Thanks! Congratulations! Glad your getting the recognition and appreciation you so very much deserve. Keep on Hooking! Congratulations, Mikey!! Can’t wait to read it! Can’t wait to see the whole magazine! Look forward to reading the interview. You always sound pretty positive in anything you write and even more so in your on-line tutorials. Will the magazine be feared on the Crafty Crowd website? I think it’s pretty neat that you enjoy the yarn crafts. Especially being a guy. Men have creativity as well as women. Crocheting is relaxing; it’s a time to relax and enjoy. Way to go Mikey! Congrats Mikey! Looking forward to reading the new magazine and your featured article. Congratulations. It’s great that your talents have been recognised by this new magazine. Creativity is not gender-based or gender-specific, we all have some creativity, whether in the arts, technical skills, cooking, or making people happy. Mikey, you are fortunate to be creative on many levels and to be able to focus your career on what makes you happy. Your videos are great, and your personality shines through each one. I look forward to every knew video. Congrats Mikey! You deserve it!! How exciting! I can’t wait to read the interview. your insightfulness always inspires me! Love love love for my kitchen. Sooo proud of you Mikey! I just love how open you are and I feel that you are a friend. Your teaching style is inclusive and fun, you are never condescending. I have come back to the craft in the past year or so, and it is due in large part to you! Thanks for all you do and your dedication to spreading the word about this fun and creative craft. Congrats Mickey! I have crocheted for 40 years, but gave up on it because I been having trouble following patterns the last few years. Finding your tutorials got me started again. I have a beautiful afghan finished and even added my own design on some of it. Thank you!! Love that you will be featured!!! I’ll be reading that article as soon as it comes out! Thanks for the amazing job you do! Love your attitude, as long as you’re happy, that’s all that really matters.